Rick and Michonne (aka- Richonne) are the couple, I, personally, have been waiting for. They’re powerful as well as smart. The final scene of them drawing their weapons right after being in bed together represents their chemistry and strength. Not to mention- one is black, the other white. The Walking Dead has never shied away from progressive relationships. Of course, you have your typical heterosexual, white relationship with Rick and Lori. They represent what society views as “normal” (although that is slowly changing). It’s what a viewer typically sees on television, as well as movies. There are also two homosexual romances. Aaron and Eric are the first gay couple to be shown on The Walking Dead. While some fans cried in outrage when they were shown kissing on the show, many were accepting. We also have the recent lesbian relationship between Tara and Denise. The best part of these two relationships is that they aren’t flaunted. They aren’t in-your-face or forced. They are treated with normality, just like the heterosexual romances. Before the Rick and Michonne moment this past weekend, there was another interracial couple. 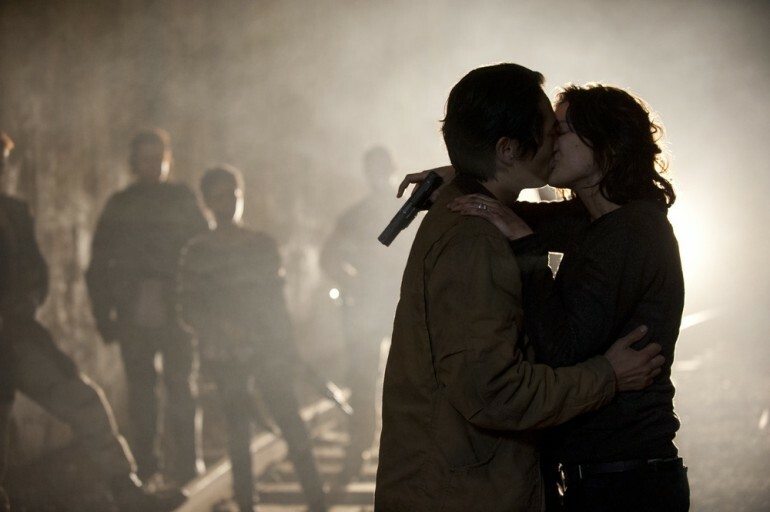 Glenn and Maggie are considered fan favorites and have been together for multiple seasons. The relationship consists of a white woman and an Asian man. Once again, this relationship was never questioned, it was simply treated as a relationship. The Walking Dead is one of the only shows that accurately represents the relationships we come across in reality. The film industry is still struggling to show progressive couples, and is often focused on heterosexual, white relationships. Not only does The Walking Dead show these couples, it also treats them the same way as straight or white partners. That is why, although this is normally a blog that focuses on film, I found it important to write about the social acceptability this show presents. It’s a great model for filmmakers to observe and reproduce.